Are you looking for some samples to see the TMT Pascal compiler in action? You are in the right place! We will gather interesting and useful examples written on TMT Pascal and put them here. Please feel free to check this page frequently. This program has a ball bouncing on the surface below and squashing as it hits the bottom. 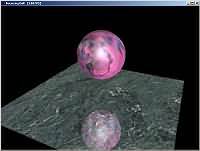 The ball has Spherical Environment Mapping applied to it and the entire thing is reflected onto the surface below. This program was based on a similar one by Andreas Gustafson. This demo shows you how to do basic cell shading also known as cartoon rendering. You can get the tutorial at NeHe's site. - Down Arrow : Decrease line width. 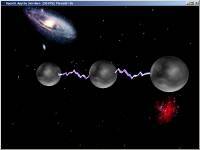 This project demonstrates creating a spark/bolt of electricity. In the app I have two spheres with a constant spark between them. If one of them get close enough to a third sphere a spark is shot across to that sphere. Keys: keypad + and - to increase and decrease the number of threads in the spark. 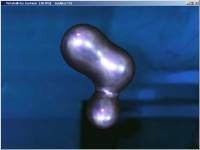 This application uses spherical environment mapping applied to the metaballs to create metaballs that look like they are reflective liquid metal. You can increase and decrease the quality of the metaballs by pressing + and - on the keypad. FaceBlur is a face I got from a 3DS model and added some radialblur onto it. Created an interesting effect. This demo is quite CPU and graphically intensive. 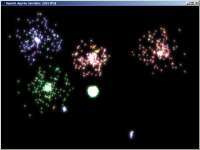 This is a basic particle system that creates multicolored fireworks. There is also a bit of gravity which slows down the rocket on the way up and causes the particles fall down after the explosion. Keys: Numeric keypad + and - to change the number of fireworks. 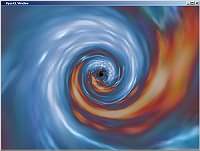 This is a tunnel effect where the texture coordinates keep changing based on a sine wave. Obviously the real effect is a lot more "alive". 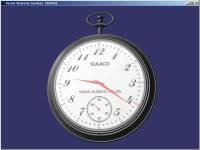 This program started out as a program to show some gears and how they interact. 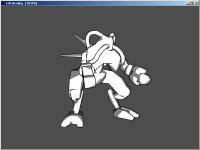 To control the object you can click and drag with your mouse. Left Button : Rotate object. Right Button : Zoom object. Middle Button : Move object. This simple game shows how to combine DirectDraw, DirectInput, and DirectSound. 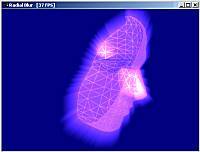 Although it demonstrates other DirectX components, it is primarily intended to show how to animate multiple sprites. The following is a complete list of game commands. All numbers must be entered from the numeric keypad. Joy refers to a joystick button. This game demonstrates many of the features of DirectDraw. 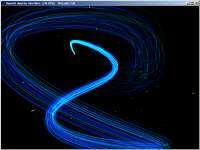 It takes advantage of hardware acceleration if it is supported by the driver. The program requires less than 1 MB of video RAM. The sound code is deliberately designed to stress the DirectSound API. It is not intended to be a demonstration of how to use DirectSound API efficiently. For example, each bullet on the screen uses a different sound buffer. 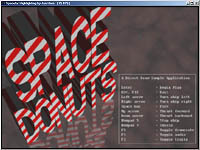 Space Donuts creates over 70 sound buffers (including duplicates), and between 20 to 25 may be playing at any time. 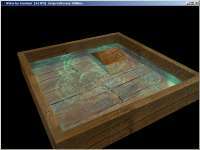 A program that uses specular highlighting as well as environment mapping. 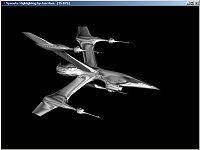 The spaceship had over 8000 polygons. You can control the rotation and distance using your mouse and enable and disable lighting by pressing "L". - Stencil 1: First draws a square in the stencil buffer. The a wireframe knot is drawn in that mask, so it only appears in the square. The same knot is drawn filled on the scene where the stencil mask dot not appear. - Stencil 2: Same as above, but it renders the knot in the square area. - Stencil 3: Same idea, but here the knot is the mask that is created in the stencil buffer and the textured square is then drawn on that mask. This program uses line strips that follow your mouse cursor to create some neat line effects. "S" toggles smooth shading and blurring effect. 1-9 adjusts the thread density. Keypad + and - changes the number of threads. This is a demo showing the effect of water drops falling into some water.